The rich get richer. Free-agent wide receiver Dez Bryant has struck a one-year deal with the NFC leading New Orleans Saints. 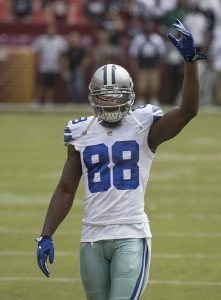 The 30-year-old Bryant has been on the market since April when he was cut by the Dallas Cowboys after eight seasons. Over those eight campaigns, Bryant hauled in 531 passes for 7,459 yards and 73 touchdowns, while making three trips to the Pro Bowl. Last season Bryant, who hasn’t had 1,000-yard campaign since 2014, registered 69 receptions for 838 yards and six touchdowns. The 6-foot-2, 220-pounder joins a receiving corps headlined by 2017 Pro Bowler Michael Thomas on a Saints team that’s second in the NFL averaging 34.9 points per game and in first place in the NFC with a 7-2 record. The Saints visit the Cincinnati Bengals Sunday at 1 p.m. Bryant’s status for the game remains unclear.